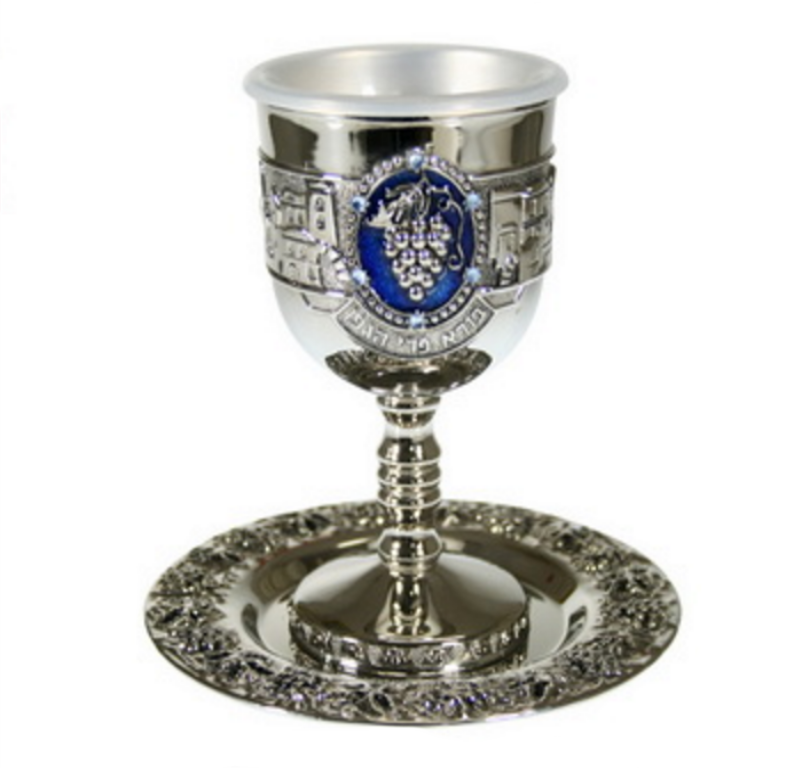 Enjoy a Shabbat Kiddush with this Old City inspired Judaica Kiddush goblet, made with real nickel. Decorated with designs resembling the old city and grape vineyards, the cup stands 13 centimeters tall. Includes a finely decorated saucer and a plastic liner to prevent any stains and damage. This beautiful Old City inspired Kiddush Cup is a sure fit for your Shabbat or Yom Tov table. Standing at 13 centimeters tall, the goblet is finely decorated with Jerusalem city engravings, a large oval-shaped, royal blue accent with a finely detailed grape cluster in the center. Below is a small banner containing the words from the Kiddush prayer, “Borei Pri Hagafen.” The stem of the cup is designed with overlapping rings, adding a bold look to the Judaica item. Included is a saucer, finely decorated with grape accents to match the goblet. Also included is a plastic liner for the interior of the cup. The prayers of Kiddush are recited on the weekly Sabbath (Shabbat) and Yomim Tovim (holidays), before eating a festive meal. Wine (or grape juice) is poured into a beautiful, decorative goblet for the ritual. Traditionally, the service is led by the head of a household on behalf of all present. The phrase engraved on this goblet, “borei pri hagafen,” comes from the final Kiddush blessing over the wine.